UFC 161 took a monstrous hit Tuesday when interim bantamweight champ Renan Barao was forced to withdraw from the main event against Eddie Wineland with a foot injury. However, the planet’s most prestigious mixed martial arts promotion is doing its best to make it up to fans. 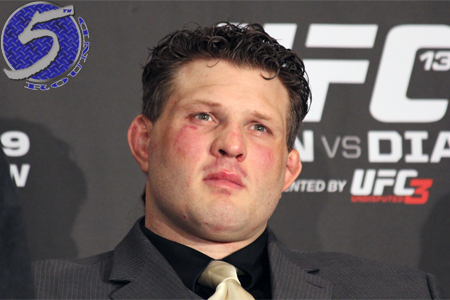 A thrilling heavyweight shootout between Roy Nelson (pictured) and Stipe Miocic has been added to the June 15 lineup. MMAJunkie first reported the scrap, which the UFC confirmed by re-tweeting the article. Nelson has won four of his past five fights, including three straight. “Big Country” was seen just last month disposing of Cheick Kongo at UFC 159. Miocic, meanwhile, is looking to bounce back from the only blemish on his résumé. He was unbeaten through nine outings until getting TKO’d by Stefan Struve in September. The organization also hasn’t decided whether Wineland will remain in the event or shelved for another day. It’s possible the main card could feature six fights if Wineland remains.